Saggital craniosynostenosis, column a normal. It’s been a tough week. Our 8-month-old grandson Hayden had major cranial surgery on Wednesday of last week. 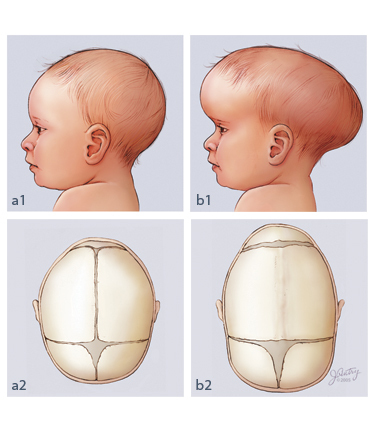 The technical name for the condition was saggital craniosynostenosis (see diagram above – Hayden wasn’t quite as pronounced as that). He was in the operating theater for seven hours and remained in the hospital for seven days. The surgery was to reshape his head. Without it, seizures could likely start as his brain could not grow sideways, only forwards and backwards, resulting in a football shaped head. We were informed that one in every 2,000 babies needs the surgery. I’d never heard of it until a few weeks after he was born. The surgery was performed at the University of Michigan’s Mott Children’s Hospital, the best in our state. It’s about 75 miles from our home. As is often the case with surgery, things did not go entirely as planned. He lost so much blood he needed a blood transfusion. In the days following surgery, he could not keep food down. Additionally, although the surgeon said that he would not feel much pain as there are no nerve sensors in the skull bones, the pediatrician said on the third day that he was clearly in pain. His face remains swollen and he spends most of the day and night crying. My wife gave our daughter a break last night and held him in her recliner while he slept. He cannot lie down in a cot yet. It’s good to have him home, but it’s going to take a while for him to fully recover. The swelling must go down. So must the pain. We’re very thankful that the surgery is available. A generation or two ago he may not have survived very long. It’s marvelous what medical science can do nowadays. I would like to also thank you all for your prayers and concern during this difficult time. Hopefully, medical science will soon find a way to stop “old” people falling. I fell on the ice this morning while taking Hayden’s two older brothers to school. As they are both aged four, they naturally wanted to look at the “owie” on my knee. I refuse to give them the morbid satisfaction of seeing me fall again! Today, at home, I thought I would try CNN International, which is broadcast from London. It’s always been a better channel than CNN. They have an “International Report” at 10am, that was also devoted to “Trump bashing,” though they did include a brief “Breaking News” item about a serious bomb blast in Baghdad, which killed at least 48 people. CNN’s audience has been shrinking, with viewers lost to Fox and Fox Business Network. Critical analysis is needed of this (and every) president, but non-stop, one-sided, often personal attacks on President Trump take away from the network’s credibility, which has been seriously eroded in recent months. No wonder people are switching to Fox. No wonder, also, that millions of households have “cut the cord” and no longer have cable, saving an average of $100 a month. Germany must stand up in opposition to the 45th president of the United States and his government. That’s difficult enough already for two reasons: Because it is from the Americans that we obtained our liberal democracy in the first place; and because it is unclear how the brute and choleric man on the other side will react to diplomatic pressure. The fact that opposition to the American government can only succeed when mounted together with Asian and African partners — and no doubt with our partners in Europe, with the EU — doesn’t make the situation any easier. So far, Germany has viewed its leadership role — at least the leadership understanding of Chancellor Angela Merkel and Finance Minister Wolfgang Schäuble — as one that is by all means in opposition to the interests of other European countries. Whether Schäuble’s austerity policies or Merkel’s migration policies, it all happened without much co-coordination and with considerable force. It is thus somewhat ironical that it is Germany, the country that is politically and economically dominant in Europe, that will now have to fill in many of the gaps created by America’s withdrawal from the old world order, the one referred to by former German Foreign Minister Joschka Fischer as “Pax Americana.” At the same time, Germany must build an alliance against Donald Trump, because it otherwise won’t take shape. It is, however, absolutely necessary. It is literally painful to write this sentence, but the president of the United States is a pathological liar. The president of the U.S. is a racist (it also hurts to write this). He is attempting a coup from the top; he wants to establish an illiberal democracy, or worse; he wants to undermine the balance of power. He fired an acting attorney general who held a differing opinion from his own and accused her of “betrayal.” This is the vocabulary used by Nero, the emperor and destroyer of Rome. It is the way tyrants think. A German parliamentary assembly has elected Frank-Walter Steinmeier to become the country’s next president by an overwhelming majority. Mr. Steinmeier, Germany’s former foreign minister, strongly criticised Donald Trump during the US election campaign. A growing number of Europeans are rebelling against decades of government-imposed multiculturalism, politically correct speech codes and mass migration from the Muslim world. Europe’s establishment parties, far from addressing the concerns of ordinary voters, have tried to silence dissent by branding naysayers as xenophobes, Islamophobes and neo-Nazis. “This disruption is fruitful. The taboos of the last few years are now fully on the agenda: illegal immigration, Islam, the nonsense of open borders, the dysfunctional EU, the free movement of people, jobs, law and order. Trump’s predecessors did not want to talk about it, but the majority of voters did. This is democracy.” — Roger Köppel, editor-in-chief of Die Weltwoche, Switzerland. In the age of Trump, America’s biggest foreign creditors are suddenly having second thoughts about financing the U.S. government. In Japan, the largest holder of Treasuries, investors culled their stakes in December by the most in almost four years, the Ministry of Finance’s most recent figures show. What’s striking is the selling has persisted at a time when going abroad has rarely been so attractive. And it’s not just the Japanese. Across the world, foreigners are pulling back from U.S. debt like never before. From Tokyo to Beijing and London, the consensus is clear: few overseas investors want to step into the $13.9 trillion U.S. Treasury market right now. Whether it’s the prospect of bigger deficits and more inflation under President Donald Trump or higher interest rates from the Federal Reserve, the world’s safest debt market seems less of a sure thing — particularly after the upswing in yields since November. And then there is Trump’s penchant for saber rattling, which has made staying home that much easier.